Willingham is back with his new series that is a bit familiar but different at the same time. If you are a fan of his Fables work then you will be right at home here. Fantasy storytelling is his forte so Lark’s Killer does a nice job of bringing a new and fresh approach to the genre. It’s a nearly all ages book but be warned there is some mild profanity and violence but good for ages 12ish and up. What I loved about the first issue is that the story starts off as one but actually ends up being the set up to the actual story. Willingham give the book the full fairy tale dressings but finds a way to make it both fresh and funny. While I will admit that the first issue isn’t flashy but it feels more like comfort food and simply works well. The story within a story worked really well in this story and adds a lot to the overall story quite well. The book really soars with Dos Santos work who is coming off a great run on the Garth Ennis recent series A Train Called Love over at Dynamite. 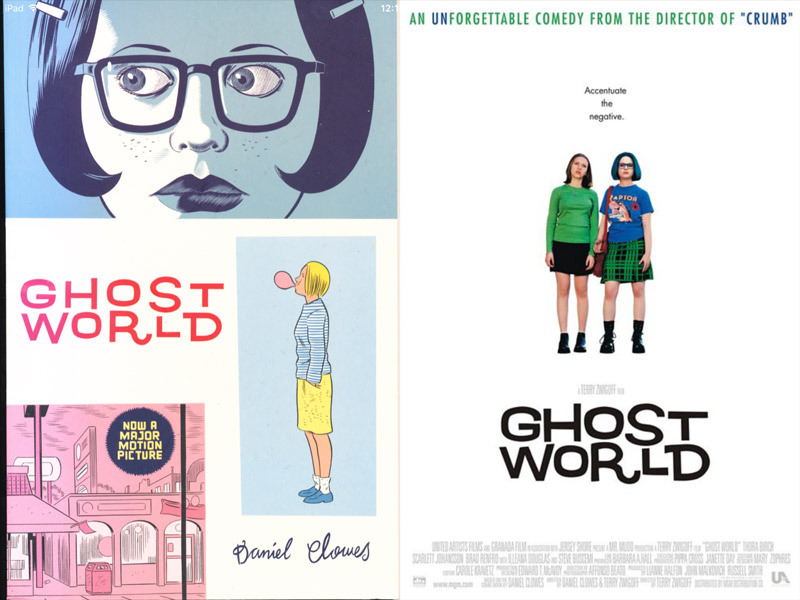 Here he pulls off two slightly different art styles for each story that is very impressive. 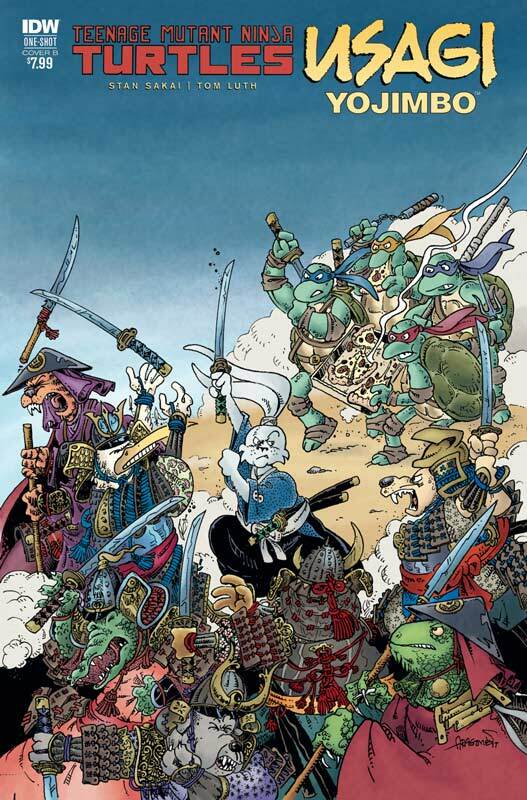 He brings a great storybook quality to the art that really captures all of the subtle elements in the script. Of course you will totally fall in love with the design of the dragon. I must point out the great color work by Auala who not only complements Dos Santos’s line work but gives each of the separate stories a different look and feel with the color that is very impressive. Is this book worth you time and money? 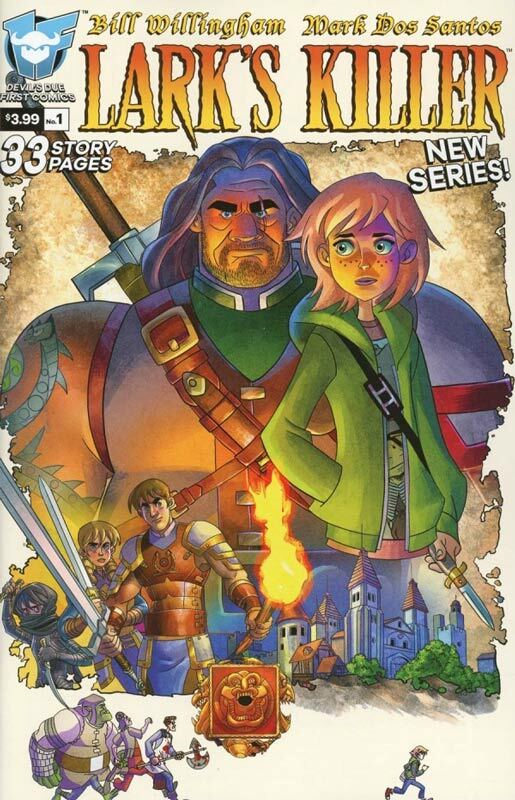 The book is not a huge stretch for Willingham with his Fables series but what this book does do very well is that its charming. The other big plus for the book is that it simply works well and doesn’t try to be more than it is. It tells a simple but solid story with a lot of great ideas for the series in the future. Add in the nice art and color work makes this a fun little read and is RECOMMENDED! The first of the six Jack Kirby 100 special that will be released this month gets off to a good start. The first story by Davis focuses on Orion with a tale that is great for new readers to enter Kirby’s Fourth World universe and a nice little story for us seasoned Kirby pro’s Davis keeps the story simple and gives a wide birth to the Kirby epic scope that he was so great at but Davis doesn’t try to just imitate his style but makes it his own and lets the Kirby flow into his story. Davis hits all of the right beats with his story and art and made for a fun read. Having Simonson do a Kirbyverse story is a real no brainer. His craftsmanship is cut from a very similar cloth as Kirby and in just 6 pages captures all of the elements that Kirby was so good at in his short stories but is pure Simonson all of the way and this story and art shows what a great master storyteller is. There are three short reprint stories of Kirby’s and that is a nice way to wrap this book up. Is this book worth your time and money? Any Kirby fan worth his comic book credentials this is a must buy book, but for readers who are not as familiar with Kirby this is a great starting point to jump in. Both Davis and Simonson craft fun and accessable stories here for new readers and while they are greatly inspired by Kirby they very much make them their own and that is what is so great about the book. 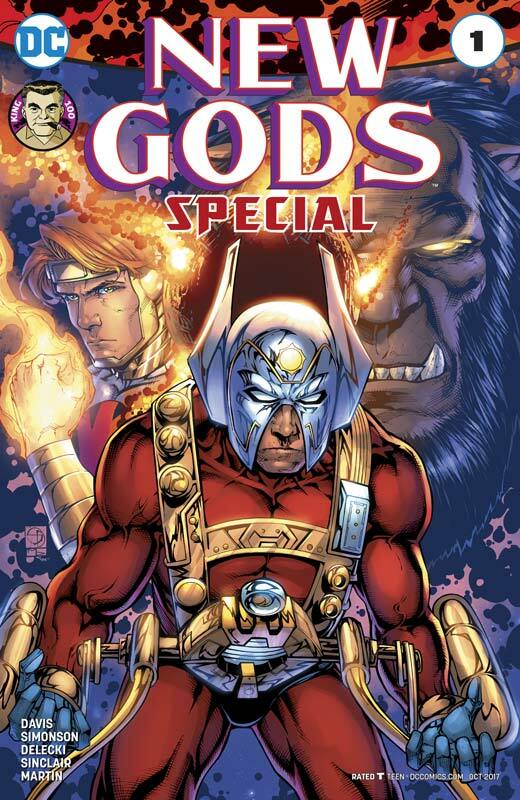 Nearly every comic creator is inspired by Kirby either from Marvel, DC or his other work and this book is not only a great tribute to him but hopefully will inspire readers not as familiar with his work to go explore it. The best way to describe this book is not only fun but heartfelt and that is what I love about it. VERY RECOMMEND! One Press Writer Kyle Starks, Artist & Colorist Gabriel Bautista, Letterer Crank! I’m a big fan of Starks creator owned comic Rock Candy Mountain so I was excited to see that he was doing another comic. Based on the table top game of the same name that I haven’t played I went into the book as a new reader as most will and found it to be a nice little surprise. 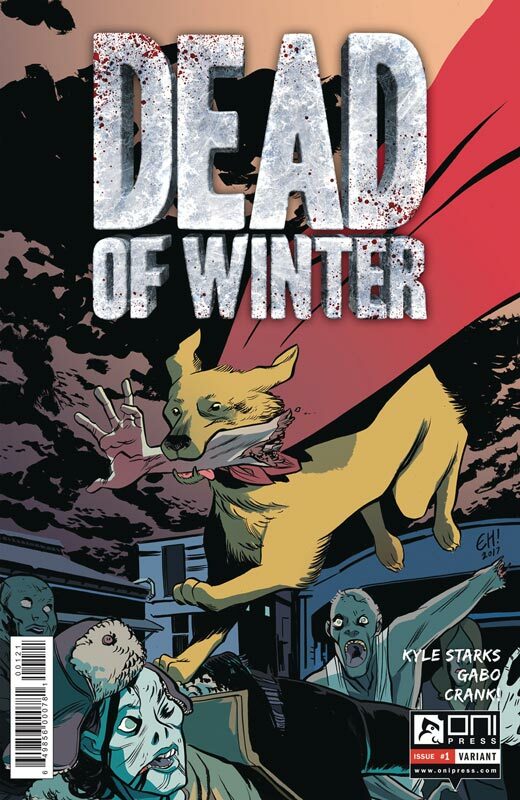 While the whole zombie apocalypse has been beaten to death, Dead of Winter didn’t bring a lot of new things to the table here but it does have Sparky the Zombie hating dog that adds a bit of fun to the genre. The one thing that Stark does well here is inject the book with a lot of humor that helps things move along. While the rest of the first issue is a pretty by the numbers affair there is a charm to the book that makes it a bit better than average zombie fest. The good news is that the cliffhanger in this first issue does set up things nicely for the second issue. The artwork by Bautista is a bit of a mixed bag here. There are many times where the art is stiff and inconsistent but it’s far from terrible. On the other hand there are some times where he really nails it. ironically Sparky tends to fare better looking than the human characters. Hopefully as the series goes on his skills will improve. Is this book worth your time and money? The book is not quite as good as I had hoped but better than I really thought it would be. Honestly it doesn’t bring that much new to the genre but with the ending of this first issue gives the story an interesting twist that will at least have me come back for a second outing. It’s worth a try if you love zombies or are a fan of the game. 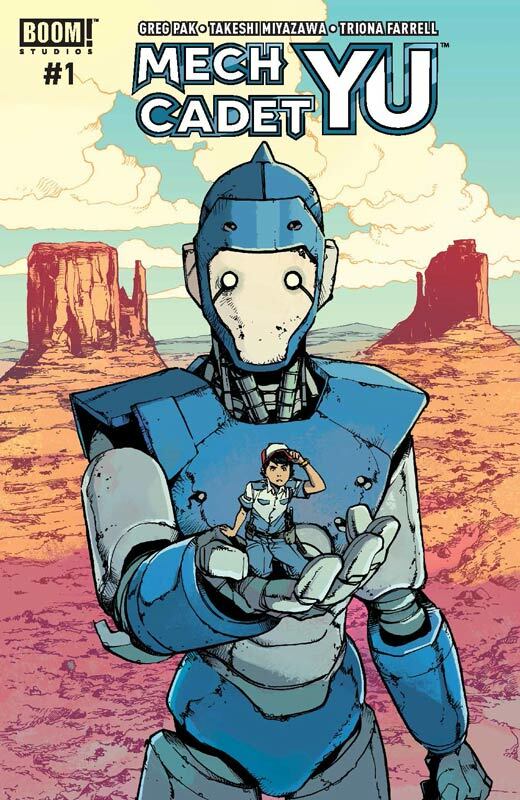 Mech Cadet Yu first issue gets off to a fairly predictable start and there is nothing in Pak’s script that you don’t see coming along and draws from familiar themes from films like The Iron Giant, Transformers, and Pacific Rim among others. The first issue is a fairly by the numbers affair and drags a little with the heavy exposition in this first issue. The real question here is what Pak has in store for the overall series. The book was a pleasant read but not very memorable when your done reading it. Unfortunately this is the same problem that a lot of other comic books that Pak has written and while I liked the concept of the book, he didn’t give me a great reason to come back for a second issue. I did however enjoy Miyazawa’s artwork on the book and his style has obvious manga influences he does give it his own spin to make it his own. There were a noticeable amount of backgrounds that were simply filled with color that bothered me but nice pleasant artwork. Is this book worth your time and money? This is one of those books that is good but not great but the biggest issue is that there is not much new here to see and Pak didn’t give many compelling reasons to come back for more and the predictable story didn’t help that either. Miyazawa’s art was nice but with the so-so script there was little that he could do. 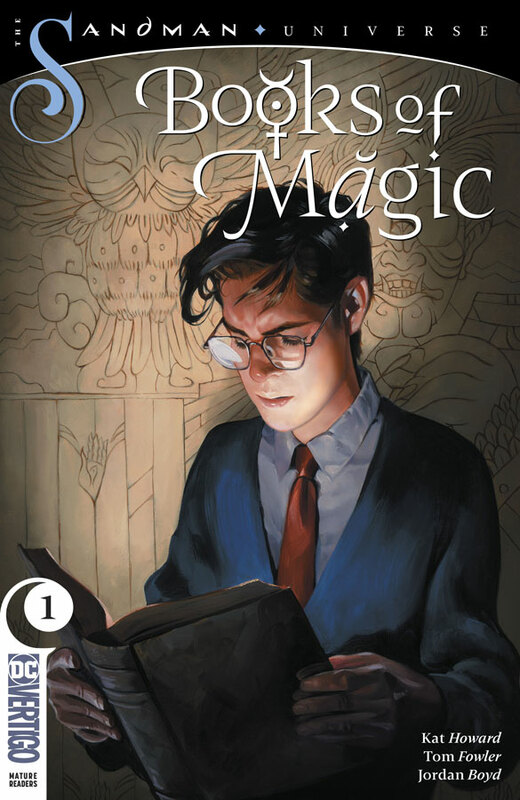 The book is simply average and in a market flood of comics that doesn’t help the books chances. Elsewhere is one of those comics that starts off pretty standard and then is able to come up with a unique twist in the story that really catches you off guard. Faeber smartly gives the book both charm and heart that helps the basic story tropes stick a bit better than it should. The first issue of the book will not blow you away but it does lay some nice ground work for the first story arc and gives the cliffhanger a nice twist and surprise at the end of the issue. It’s one of those comics that aims for the middle and hits it perfectly. In a sense it doesn’t try to be more than it is. 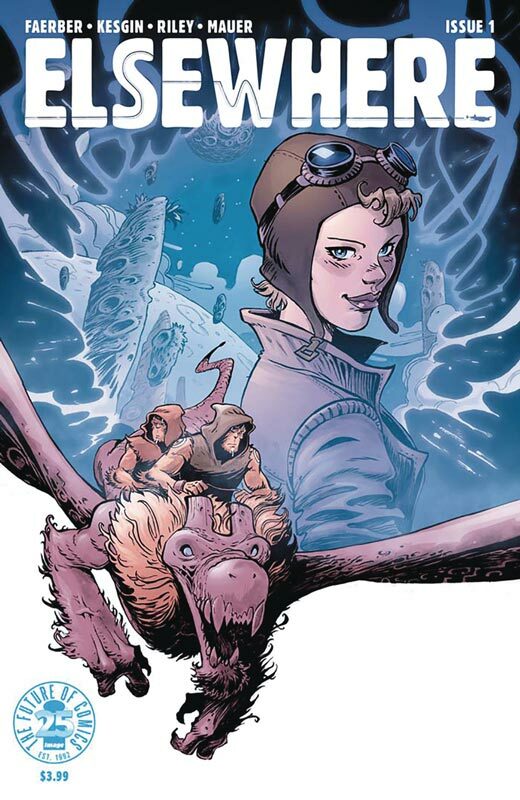 Faeber wisely doesn’t try to push the story to far out in the first issue he sets the story in motion and gives you a good reason to come back for a second issue. The key going forward is will he be able to keep injecting freshness into a tried and true story structure that he builds the book on. Kesgin does a nice job on the artwork in the book and handles the facial expressions very nicely here. I wish that he would have put a bit more into the backgrounds that are a bit sparse at times but overall gives the story a nice look and feel that is a plus for the script. Is this book worth your time and money? There is nothing earth shattering here Faeber gives a basic story trope some good ideas here and it was a nice read with a surprising cliffhanger at the end and gets the book off to a good start. Throw in Kesgin’s nice artwork and it’s worth giving the book a swing at. 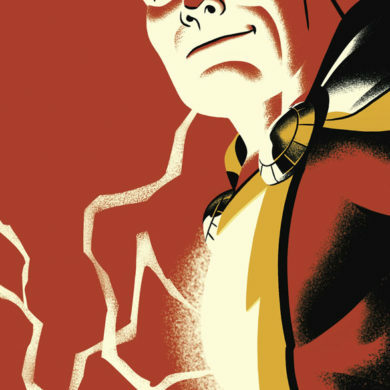 Fingers crossed that they will build upon this first issue. 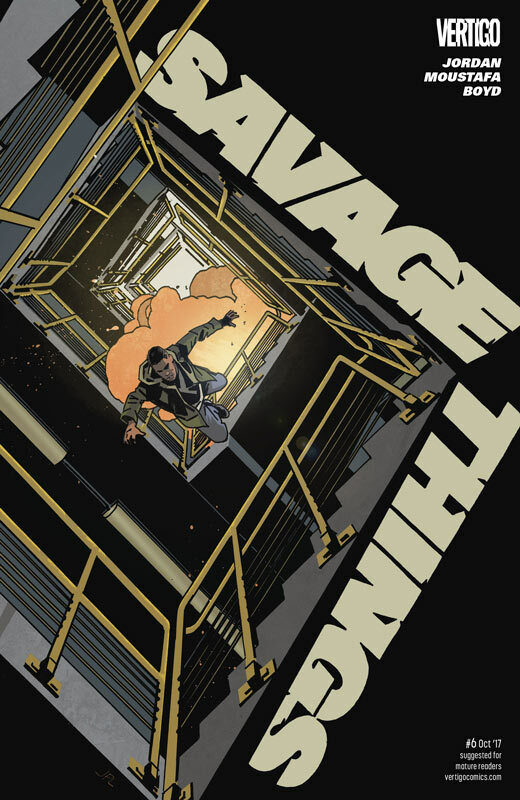 Jordan and Moustafa’s Savage Things continues to be one of the most pulse pounding comic books that keeps you on the edge of your seat. Action based comics are a very tricky thing to pull off but I have to give props to Jordan who continues to craft each issue as a fast paced read that while it never last long enough, it’s surprisingly satisfying. The way that he has unfolded the story with the revealing of the past and how it connects to the present has been handled quite well in this book and gives it the perfect balance with the rivalry of Cain and Able. It’s one thing to have a great script each issue but for the book to work as well as it does is where Moustafa’s pitch perfect art comes into play. The way that he draws each panel of the action is impressive because you feel every beat of it and never feel as if your missing a moment of it. While the action is the main part of the story it’s the emotions of the characters that Moustafa brings to the book that makes it all work so well. He gives you a reason to care about the characters because of the level of detail that he puts into each stroke of art. Is this book worth your time and money? 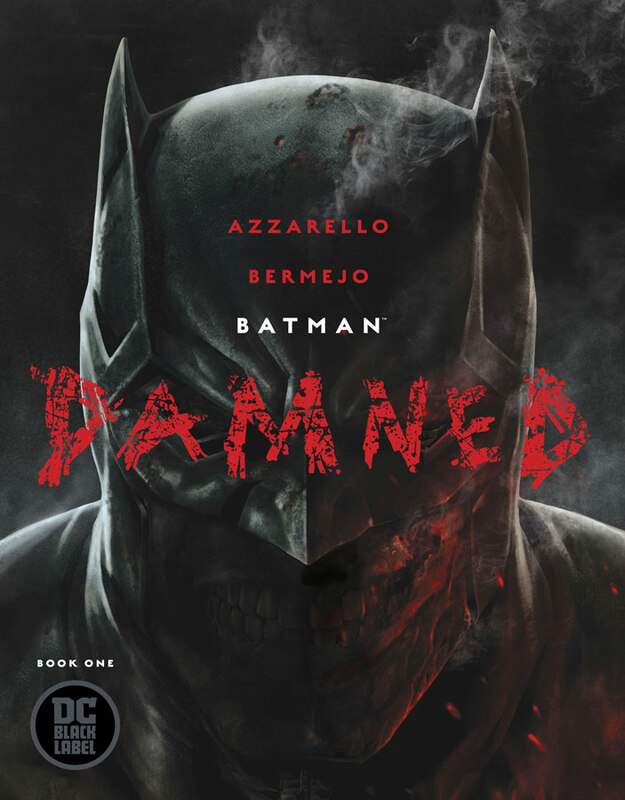 Each issue of this book is so fast paced that it ends up being a quick read but it really sticks with you after you finished and leaves you wanting more. It’s the depth of the story and the perfect art that makes this a must read comic every month. This issue sends the story into its final stretch and it’s a story that I can’t wait to see where they take it to. HIGHLY RECOMMENDED! This book hit the ground running from the beginning but this issue is a real game changer. The scope of this issues battle left me simply stunned and shocked in the best way possible. What makes this book so good is that Johnson never loses sight of what makes the story so good is the emotions of the characters. When you are writing war scenes in a comic the key to make them work is that you must make the reader care about the characters and feel their pain during it. This issues story was so heartfelt that showed the horrors of war and the price and toll that they take on people. Johnson not only nails the script in this issue but captures both the large and small details of it so well. The back to back two page spread that starts the issue off are visually spectacular and the level of detail will have you looking at everything on the page and letting it soak in and while that is impressive, it’s the sacrifices and emotional scenes that capture the heart and soul of this book. The subtle way that he captures those scenes nearly had me in tears and that rarely happens in comics. Is this book worth your time and money? 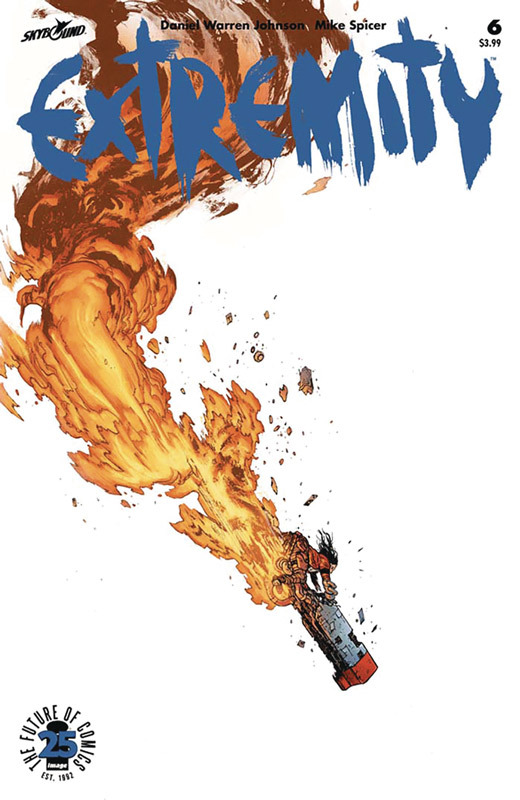 Rarely does a comic capture the scope of war and then balance the emotional impact to affect your heart at the same time but Johnson is crafting an epic tale here in Extremity that does both so perfectly well. Usually a comic starts off strong and then is unable to keep the momentum going but that is not the case here. Each issue not only builds the story but leaves an emotional impact that is a very rare feat. HIGHLY RECOMMENDED! 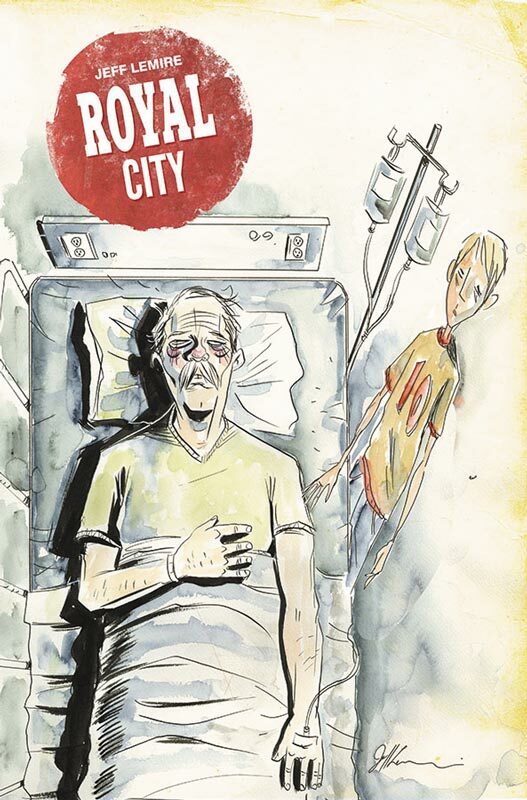 Lemire brings us to the end of Royal City first story arc and to say that it blew me away is an understatement. 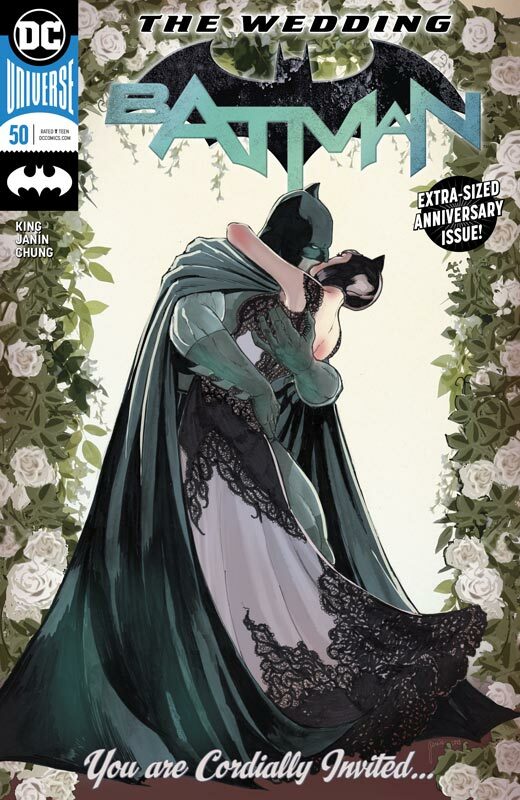 This issue reveals some of the underlying story elements that are a real game changer for the story and then he goes and literally sets off a shocking game changing element at the end that leaves you stunned and impressed all at once. I love the slow burn approach that Lemire is taking with the story in the book. One of the most intriguing things about the book is the way that he is unfolding the story that doesn’t follow a fully linear path but that is what makes it such an enjoyable experience. What happens in the past is reflected on the present and vice versa. The way that he takes timelines and seemingly runs them concurrently is a bold story choice but one that is working so well. I am a huge fan of Lemire’s art style and is one of those rare writer/artists that plays both sides perfectly here. The art has an etherial look and feel to it that captures every emotional beat perfectly. He also uses a very precise color palette to capture the tone and emotions of the story that is a visual feast. Is this book worth your time and money? I have loved this book from day one and Lemire continues to impress with each passing issue and this one is no exception. There is a lot to take in with Royal City and there are many mysteries that are still to unfold and it’s a comic that leaves you with mixed emotions and that is a very good thing. VERY RECOMMENDED!